I’m wrapping up a work trip to San Francisco – waiting in the airport as I type – and had to post about the most fabulous breakfast ever. 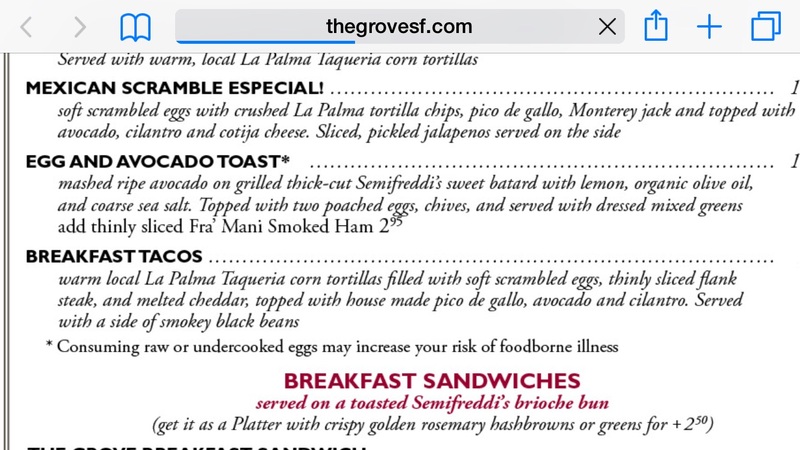 On my last trip to SF two years ago I stumbled upon a local mini-chain called The Grove (www.thegrovesf.com, adding links is wonky on my mobile device, sorry!). This place was right around the corner from my hotel and serves EXACTLY what I like to eat, no matter what time of day. Fast forward to this trip: different hotel but same neighborhood, and being a creature of habit, I went back to The Grove every day I was in town. Yesterday I had to do a work event (book signing; did I mention my group wrote a book?) and give a lunchtime talk for an hour and a half, which meant my usual morning routine of just coffee wasn’t going to cut it for most of the day. I headed to The Grove for some breakfast fuel and had goat cheese and basil scrambled eggs with a side of rosemary potatoes, and it totally hit the spot. Today I squeaked in one more visit before my cross country flight home. Should I not mess with success and have the scramble again or branch out to something new? What made me hesitate is that while I am overall a lousy cook, I make a decent avocado toast and didn’t want to be disappointed. Within one bite, I knew that this avocado toast forever shamed my version. It was heaven. 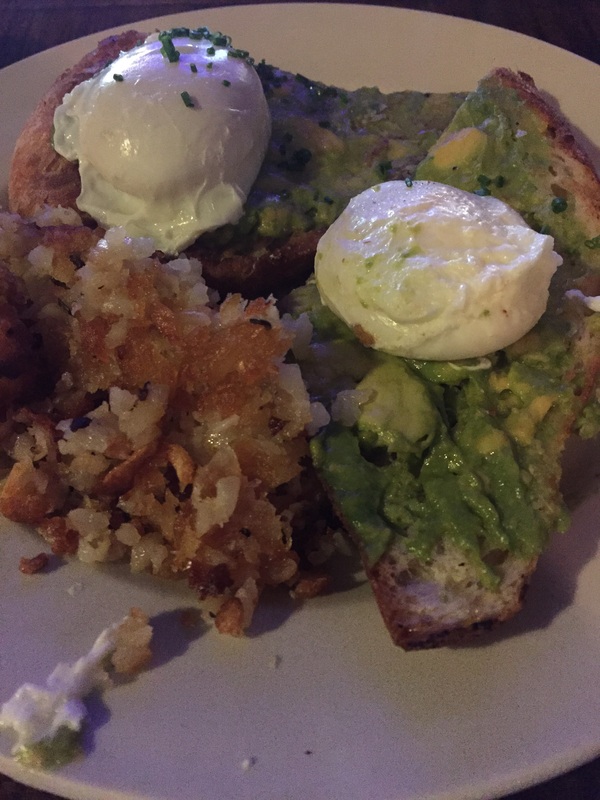 The sourdough toast was rubbed with olive oil and lemon, topped with avocado and then finished with two perfect poached eggs and those fabulous Rosemary potatoes on the side. The whole thing was easily smashed into a delicious mess. P.S. 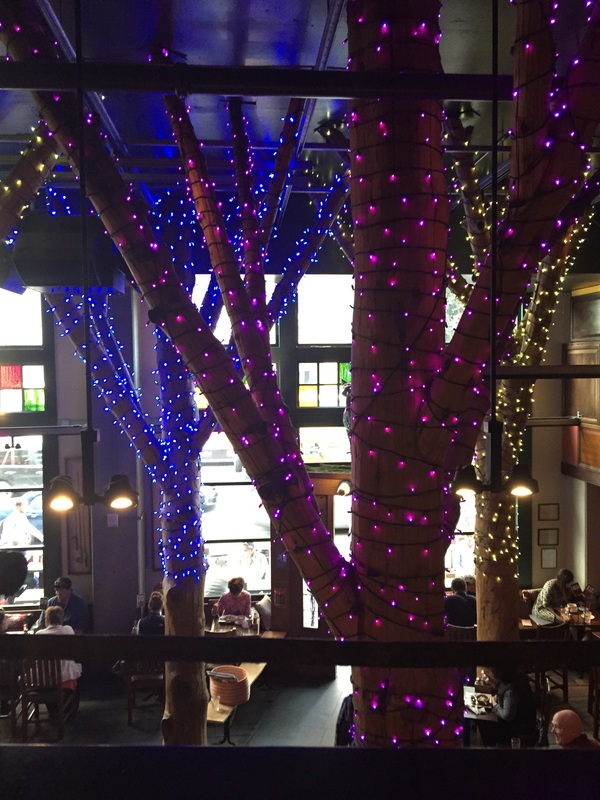 Here’s a picture of the inside of the restaurant, which is funky and charming.